Yes…You need to learn how to sell! The only way to increase your success is to learn how to SELL. But, selling your products, services, or ideas to an increasingly skeptical world is harder than ever. 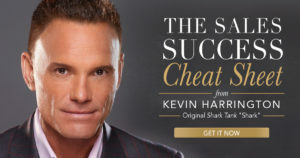 Zig Ziglar and Kevin Harrington to the rescue! You probably know the name Zig Ziglar. He impacted more than 250,000,000 people in his lifetime. He also pioneered modern sales training and is responsible for literally millions of successful entrepreneurs, salespeople, and leaders today. And Kevin…wow, what can I say about Kevin. He invented the infomercial. He’s a founder of Entrepreneurs Organization. He was the Original Shark from the hit TV show Shark Tank. Oh…and he’s sold more than $5 BILLION worth of products in his 40+ year career. Zig was Kevin’s mentor and together they have truly changed the world as we know it. He is literally giving away his exact blueprint he has used in his career to more than 100X his sales. If you want to experience a breakthrough in your business, your sales, or with spreading your message, you need to watch this. Whether you are just getting started in your business or if you’re a seasoned pro, Kevin’s lessons will help you to overcome any fears of selling and gain the confidence you need to realize your dreams. Maybe you have a killer idea but struggle to get in front of the right people. Kevin will show you how in this video. In this video, you’ll learn how to handle objections and get people to take action (and buy from you). Watch and learn as Kevin shows you step-by-step how people who are driven to succeed – people like YOU and me – can explode their sales and experience over-the-top success in business and in life. Are you ready to get Kevin’s blueprint? P.S. It should go without saying, but I’ll warn you anyway. What Kevin shares in this video is incredibly powerful. In the wrong hands, this information can be used to manipulate others. Kevin shows you the true secrets to selling ethically and from a spirit of serving. If you want to revolutionize your business and your life, exponentially increase sales, and increase your overall influence – all without being scammy or sleazy – then don’t miss this video. This entry was posted in Truth for Thursday and tagged Learn to sell. Bookmark the permalink.